Please note that I am on maternity leave for the rest of 2018. Scheduling will be available again in the second quarter of 2019. Thank you for your understanding! Pearl River Bodywork is a fully-licensed and fully-insured provider of professional therapeutic massage therapy in west Madison, Wisconsin. I am trained in a number of massage modalities and techniques including tui na (Chinese medical massage), cupping, Swedish massage, acupressure, sport massage, foot reflexology, and deep tissue massage. 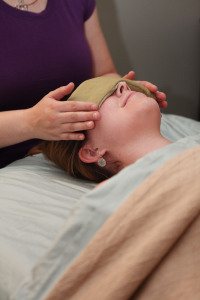 Let me work with you to find the best combination of approaches that is most therapeutic and relaxing for you. Convenient afternoon and evening sessions are offered for people who cannot make an appointment during the day and typical business hours. I invite you to contact my clinic today and experience for yourself the benefits of massage therapy. Please use the above link when booking. Other scheduling sites and apps, such as mytime.com, are not authorized to handle scheduling for Pearl River Bodywork and do not have accurate days and times of availability.